While I was still at home preparing for my 2014 Zion National Park artist residency, I had developed the desire to examine and depict Zion in a different way than most people experience or perhaps interpret it. When one spends only a short while in places such as Zion, the impressive geology and terrain command all senses. However, if one is lucky enough to have more time, such as that afforded by an artist residency or is more observant of smaller environments, the hidden life that is the heart of the place becomes apparent. I became intrigued with focusing on the microcosms of Zion, placing the massive towers, cliffs, and temples in the background like a spoiled child who is used to getting all of the attention and is in need of a “time out”. My residency during September 2014 was marked by many rainstorms, some severe enough to close down the entire Park for portions of time; I discovered that the banks of the Virgin River were wiped clean after every storm, becoming a blank palette for the comings and goings of the canyon’s creatures. After a few rounds of sketching and simple photography along the unnamed riverside path that parallels the Virgin River just steps away from Grotto House, I surprised myself by developing a design that is in some ways quite unlike my previous work. I designed canyon tide using two of my photographic images to create a transparent collage of the canyon’s cliffs superimposed over a view looking straight down onto the river and its bank marked with tracks of turkeys, birds, and insects. 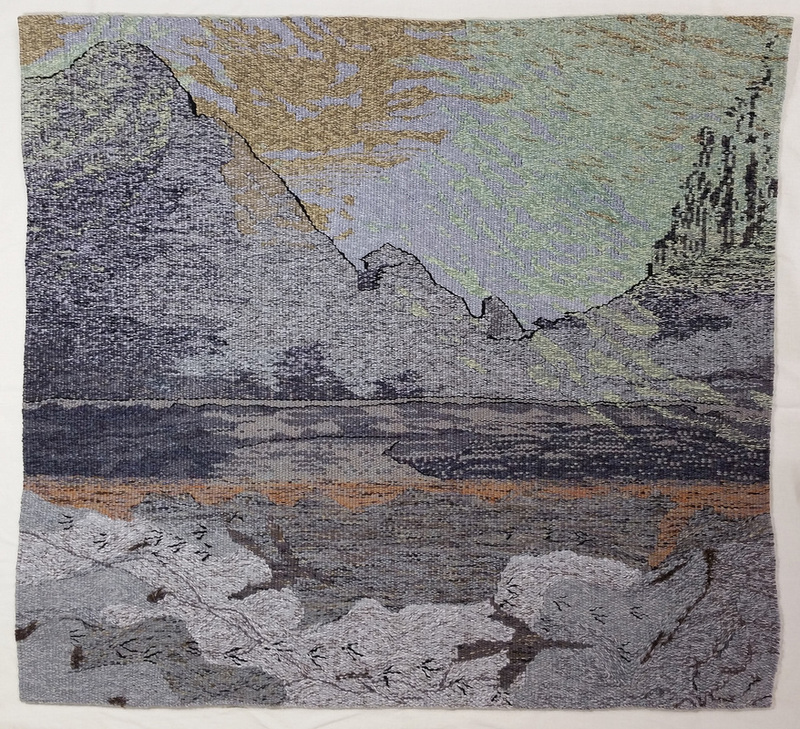 This tapestry is the most intricate and in many ways challenging work I have done to this point, and it epitomizes the invisible world of Zion I was so fortunate to witness during my time in residence at Grotto House.